Whether they make it to high school ball or the Major Leagues, everyone has memories of playing wiffle ball in the street or backyard. 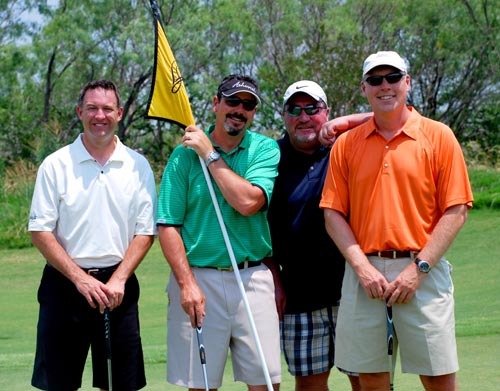 Members of the HealthyPlay! Wiffle Ball League had the privilege of learning some wiffle ball skills and tricks from future New York Yankees on Saturday, June 11. Charleston RiverDogs center fielder Slade Heathcott, and catcher J.R. Murphy, tutored the youngsters in a two-hour session at Joseph P. Riley, Jr. Park Saturday morning. The HealthyPlay! Wiffle Ball League (HWBL) is presented by the PlayToday! Foundation, in partnership with the City of Charleston Parks and Recreation Commission and the Charleston Miracle League. The goal of the HWBL is to provide 8-12 year old children from underprivileged backgrounds a chance to participate in an organized sports league over the summer. Following the instruction, all participants capped off a memorable morning with a game, supervised by the RiverDogs’ two newly minted SAL All-Stars. In addition to the lessons learned from being part of a team, the HWBL is designed to boost children’s self-esteem, and encourage exercise and overall physical fitness through nutritional guidance. Throughout the season, prominent members of the Charleston community will take time to address the children and answer questions about what it takes to succeed in today’s world. The Mississippi Braves visited to the Blair E. Batson Children’s Hospital on June 10th. 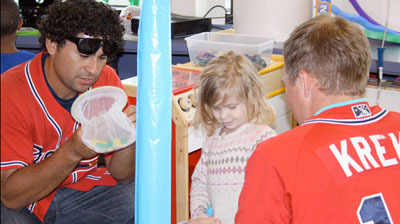 The team arrived to offer support and bring hope and happiness to children struck by injury and illness. The Blair E. Batson Children’s Hospital has treated over 150,000 children from over 82 counties in Mississippi last year. The hospital strives in treating every youngster who is in need and has never turned anyone way. The institution strives to be the best with its cutting edge equipment and state-of-the-art facilities, however, more is always needed. During the M-Braves visit, players from all over the world visited with the kids, signed autographs, and provided cheer to all those in need. The Indianapolis Indians are giving away $10,000 in celebration of 125 consecutive years of professional baseball in Indianapolis. The program entitled “Lend a Helping Glove” has five local charities competing for a $10,000 grand prize. 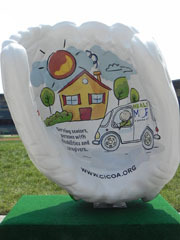 Given a blank slate on a 5 foot fiberglass baseball glove, charities were asked to decorate their glove and put it on display in Indianapolis. Through a text vote, online vote and a celebrity panel vote, a winner will be decided. Voting began on June 3rd and ends at 11:59 PM EDT on August 19th. The winner will be announced at the Indians game on Friday, September 2nd versus Louisville. Participating charities include the Boys and Girls Clubs of Indianapolis, Boys Scouts of America, CICOA, Indy Reads and the Salvation Army Indiana. For more information on the program, visit www.lendahelpingglove.com. 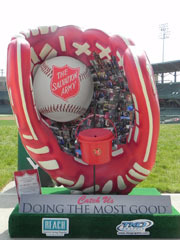 Glove for the Salvation Army of Indiana. 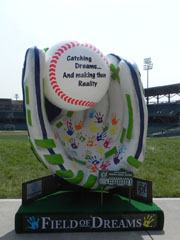 Glove for the Boys and Girls Clubs of Indianapolis. Seat your group all together and raise money at a Naturals game. 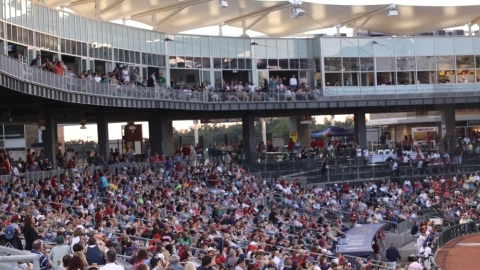 SPRINGDALE, AR – The Naturals, through ticket fundraising programs, have helped local groups raise over $66,000 during the first two months of the baseball season. Through the first 23 home games of the 2011 Naturals baseball season, 55 local groups comprised of school groups, church groups, and other local organizations have raised $66,462 by coming out to Naturals games and selling tickets for the same game to friends and family members. Several of these groups have also partaken in activities on the field such as playing the National Anthem, tours of the ballpark, and playing pre-game performances. The average ticket fundraiser group has raised $1208 with the Naturals this season. 45 of the 55 participating groups raised at least $800 dollars (by selling 200 or more tickets). The total money raised through these programs is already $7,000 more than the money raised all of last season, including playoffs. The Naturals currently have availability to help groups raise money all summer long on Sunday through Thursday home games following the July 4th holiday weekend. For more information about fundraiser groups as well as other group offerings, visit nwanaturals.com or call 479-927-4900. SPRINGDALE, AR – The Northwest Arkansas Naturals visited the tornado stricken city of Joplin, Missouri on Monday on the heels of a six-game homestand that saw the Naturals collect $6,659.66 in donations and nearly $7,000 total in cash and items to contribute to the relief effort. The donations will be made to the Red Cross of Northwest Arkansas and highlighted during the game during a short check presentation on the field. 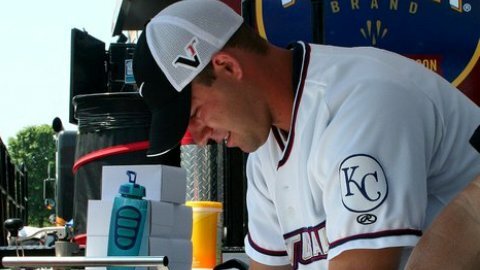 Catcher Ryan Eigsti along with left-handed pitcher Buddy Baumann, General Manager Eric Edelstein, and the Naturals’ mascot Strike visited Joplin earlier Monday to assist in serving a lunch to tornado victims and volunteers helping with the relief efforts. During the first five games of the Naturals’ current six-game homestand, the club has held a jersey auction, sports memorabilia auction, nightly post-game launch-a-ball, and optional donations at Red Dirt Outfitters. The club also extended an offer for free tickets for Joplin residents during this homestand. In addition, the Naturals’ parent club, the Kansas City Royals, via its Royals Charities non-profit arm made a $25,000 donation to Heart to Heart International for its relief efforts in the city of Joplin. In addition, Royals fans generously contributed more than $18,000 during an in-stadium collection held earlier this homestand that will benefit the American Red Cross relief efforts. The Mississippi Braves along with Bass Pro Shops, Tracker Marine, and Uncle Bucks Grills have joined forces to aid the victims of the Mississippi River Floods. On Monday, May 30, 2011, The Braves and Bass Pro Shops presented a $5,000 check to The Salvation Army to help jump start the relief effort. Furthermore, prominent members of the community such as Minor League Baseball President Pat O’Conner, Vice President of Business Development for MiLB Tina Gust, and Pearl Mayor Brad Rogers came to show their support and encouragement during this tragic time. The Salvation Army’s Jackson, MS Area Coordinator/Corps Officer Captain Ken Chapman, U.S. Congressman Gregg Harper, Lt. Governor Phil Bryant, MS State Representative Ray Rogers, and MS State Senator Dean Kirby also attended the pre-game ceremony. The Braves further aided the cause by donating 100% of the revenue generated by a special silent auction during the game. The silent auction featured various items for fans to bid on, such as autographed baseballs, bats, photos, and jerseys of various Braves players. As a further way of providing assistance, the M-Braves encouraged fans to donate items such as clothing, shoes, water, non-perishable food items, and personal hygiene items to The Salvation Army. The Braves did so by providing fans who donated items to the cause a 50 percent discount on field seat tickets. Plus, the first 500 fans that donated items to the relief effort received their choice of a free Jason Heyward, Freddie Freeman, Brian McCann or Jeff Francoeur 8 x 10 color photo. The Braves are still encouraging fans to continue to donate items for the relief effort, and drop them off at Trustmark Park throughout the year. General Manager Steve DeSalvo helping load the donated items onto the Salvation Army Truck. 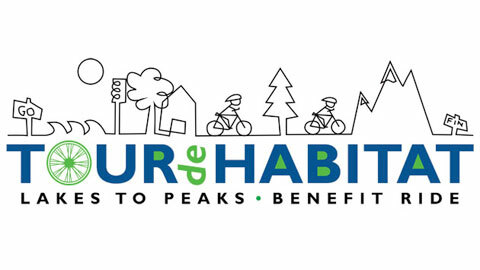 The Orem Owlz and Habitat for Humanity of Utah County will be teaming up on Saturday, June 11 at 6:30 p.m. for the Third Annual Tour de Habitat, Lakes to Peaks Bicycle Ride. Owlz mascots Hootz and Holly will be the guests of honor to kick off the Family Ride which will be part of the pre-parade activity for the Orem Summerfest. Those participating in the Family Ride will receive reserved seating for parade viewing later that evening, an event t-shirt, and Owlz 2011 game tickets. For more details and to register please visit www.habitatuc.org/events/tour-de-habitat.html. This article originally appeared on the official website of the Orem Owlz. Click here to view the original story. FORT WAYNE, Ind. 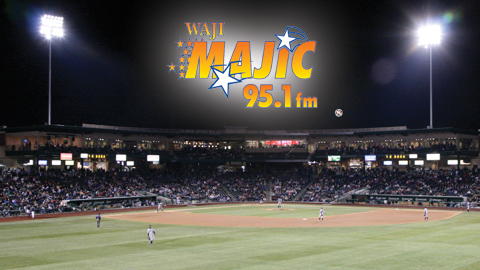 – The Fort Wayne TinCaps have partnered with Majic 95.1 to encourage downtown workers and visitors to “Conquer the Concourse” at Parkview Field this summer. In conjunction with the opening of the ballpark’s Field of Greens cart for summer lunches, the TinCaps and Majic 95.1 are encouraging those visiting the ballpark to join in the challenge to see how many laps they walk between Memorial Day and Labor Day.Walkers and runners are encouraged to stop by the Field of Greens cart between 11:00 a.m. and 1:00 p.m. to fill out a “Conquer the Concourse” registration form. Throughout the summer the number of laps walked during each visit to Parkview Field can be recorded on their registration form which will be available each weekday at the Field of Greens cart (11:00 a.m. to 1:00 p.m.). Those walking at other times of the day are encouraged to keep track of their laps and periodically update their lap totals throughout the summer. The Field of Greens cart, open 11:00am to 1:00pm, Memorial Day through Labor Day, has health-conscious menu items including salads, wraps, and sandwiches as well as chips and drink options. The Mississippi Braves in conjunction with the Atlanta Braves, Gwinnett and Rome Braves, 680 the Fan and Rock 100.5, corporate partners, and The Salvation Army have joined forces to raise money, awareness, and support for the Southeastern tornado relief efforts. 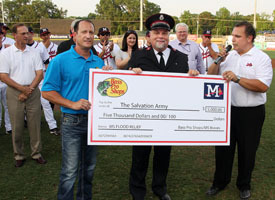 The Mississippi Braves parent club began the effort Monday, May 2, by donating $100,000 to The Salvation Army. As Atlanta’s AA team in the heart of Mississippi, the M-Braves will be a central location in the Jackson Metro Area for a drive to collect the most needed items for the victims of the devastating tornados. Currently, The Salvation Army Emergency Disaster Teams have been deployed and are in the process of helping the thousands of people in need. In addition, The Salvation Army is asking for various donations which will be distributed across the six states devastated by these brutal storms including Georgia, Alabama, Arkansas, Kentucky, Mississippi, and Tennessee.